That was the plan for little Simone. But then on the way coming out of the womb it said name me God and parted stuff you didn't want to see parted. So Gods here now and after killing the doc that smacked him jumped Katy Perry me Luvs chest. As soon as through with that meal I think ISIS is his first target? At the moment he is mumbling Heaven, I am in Heaven. As opposed to the hundreds of thousands ghetto babies named african and ebonic-derived first names. Simone is a beautiful name. It has a very mysterious aura and it sounds exotic. 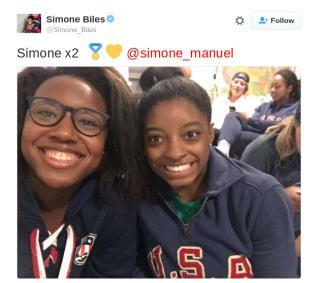 Congratulations to both, Simones, for their Olympic achievements and medals! May they have many more years of success and happiness.